Based on the Mexican festival where people pay their respects to friends and family members who have met their maker, Day of the Dead is a 5 reel, 720 ways to win video slot from IGT. It comes with win both ways payouts as well as a bonus feature that awards up to 240 free spins. It can be played only on desktop devices from 50p to £2,500 per spin. Day of the Dead is played using a 3x4x5x4x3 game engine which offers 720 ways to win – winning combinations are formed when the same symbol lands on adjacent reels and can hit from right to left as well as the more usual left to right. A macabre feast is the setting for Day of the Dead – surrounded by food and candles, the reels include flowers, a selection of fruit, a punch bowl, a pie, Mr and Mrs Skeleton and a skeleton mariachi band. The Day of the Dead logo is the most lucrative, awarding 1,000 coins if you land 5 on a row. There’s also a scatter that awards 2, 10 or 50 times your total stake if you land 3, 4 or 5 anywhere on the reels on the same spin. The coffins symbol is the game’s wild, appearing on the middle 3 reels only and replacing everything bar the bonus and scatter. The wild can land fully stacked and fill the entire reel in which it appears. Land 5 Bonus symbols on successive reels to trigger the Free Spins Bonus feature and with it 8 free spins. Given the way the game engine is set up, it’s possible to land more than 1 configuration. 8 free spins are awarded for 5 symbol combination with a maximum of 96 possible from the triggering spin. You can re-trigger even more free spins in the feature with a possible 240 on offer! The visuals in Day of the Dead are decent enough – pastel shades dominate the colour palette and it can be a little overpowering at first glance. The soundtrack is a corker though, giving a real flavour of Mexico. You can expect plenty of action courtesy of the 720 ways to win game engine and the free spins feature offers plenty of potential. As far as design goes, it doesn’t hit the heights of Esqueleto Explosivo from Thunderkick which has a similar Mexican theme. 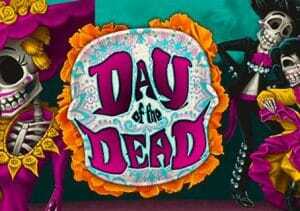 If you do enjoy that slightly creepy theme, then you’ll want to pay your respects to Day of the Dead.